Kernighan and Ritchie's The C Programming Language, of course; second edition, which describes ANSI C.
Stroustrup's The C++ Programming Language, second edition (the last one before it got too big and ugly to contemplate). Kernighan and Pike's overlooked classic, The Elements of Programming Style. The only programming book I know that can make me laugh out loud. Kernighan & Plauger's Software Tools. The single best book on programming I know, despite all the code being in RATFOR (structured FORTRAN). 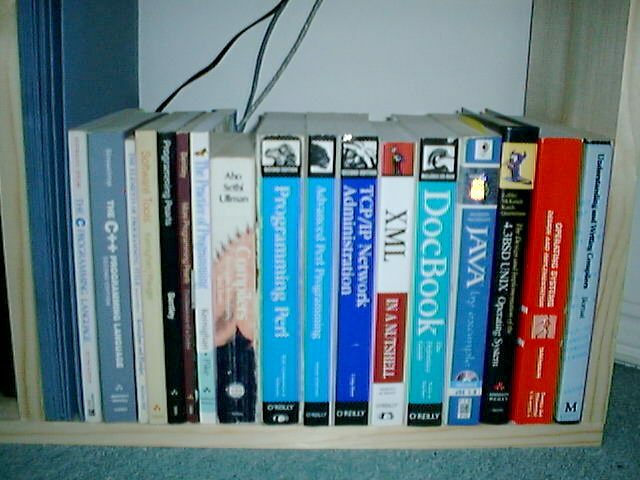 Jon Bentley's Programming Pearls, excellent ``light reading'' and full of insight. Kernighan & Pike's more recent The Practice of Programming. Aho, Sethi and Ullman's classic on compiler design (though I've only ever really used the parsing bits): Compilers: Principles, Techniques and Tools, better known as The New Dragon Book. Sriram Srinivasan's adequate but disappointing Advanced Perl Programming. Craig Hunt's definitive TCP/IP Network Administration. Walsh and Muellner's DocBook: The Definitive Guide, which covers all the necessary ground but ought to be only about a quarter as long as it is. Jackson & McLellan's Java by Example. It was rubbish when I bought it seven years ago, and it's rubbish now. The O'Reilly Java in a Nutshell is a hundred times better. The Design and Implementation of the 4.3BSD Operating System, by Leffler, McKusick, Karels and Quarterman. Fascinating and very detailed, though I admit to never having read more than about half of it. Andrew Tannenbaum's once-definitive book on O/S design, Operating Systems: Design and Implementation, which contains a complete listing of Minix. Richard Bornat's Understanding and Writing Compilers.